The Brown bear moved out of the forests during the last ice age and became a subspecies now known as the Polar Bear. This white bear is now moving again because of climate change caused by humans. Both our species face possible extinction if we do not bear witness to this fact. In 2018, I traveled to Iceland last winter and this past summer to the high arctic by ship with Adventure Canada. The plan was to travel through the Northwest Passage on their ship, Ocean Endeavour. I am continuing to paint stories about the Northern latitudes. record time past and then melt into the present. Going to the arctic I am a keeper of time in my paintings. Like the ocean and ice my images expand and recede. I am asking you the viewer to wander with me there and make your own stories. The polar bear in this series is my spirit animal as guide. This marine mammal goes in and out of the arctic sea, as a quiet hunter. The polar bears powers and strength represent endurance and patience. I need this as an artist. This bear knows well where he is in his life and how to surrender to that when needed. I am learning from him. My paintings exist between the living world and spirit world. 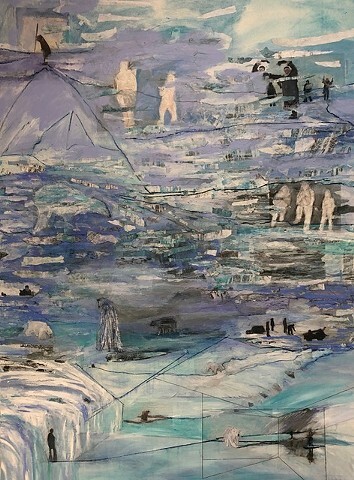 On my canvas, I move the images and worlds in and out of spatial realms like the polar bears moves between the ice and Arctic Ocean. Sometimes the wanderings are to search for food for the bear and for me the true north an orienting point used as an internal compass. It helps me to stay level in a spinning world. And with this true north there is the magnetic north that moves my paint and brush freely in response to the earths magnetic field. It moves the worlds on the canvas from place to place not fixed in relation to an X, Y or Z axis. The north magnetic pole is a wandering point on the earth and canvas surface.